Liquid promised us a hard look at the team. Now they’ve made good on that promise with some big changes. In a surprising move a week ago, Team Liquid announced that it was in the process of revamping its underperforming League of Legends roster. Speaking candidly, team owner Steve Arhancet and League manager Michael Artress indicated that no stone would be left un-turned. Liquid would look at substitute players, role swaps, and whole-scale strategy changes in a desperate attempt to right the ship. The first shoe dropped today—according to a report from ESPN, the team will be swapping star AD carry Chae “Piglet” Gwang-jin to the mid lane. Piglet will replace Grayson “Goldenglue” Gillmer, a highly touted solo queue prospect who has never been able to put it together on the LCS stage. Goldenglue’s lane stats are some of the worst in the game, and he is often late to roam and teamfight, even when Liquid is the team engaging. Arhancet did not mince words when speaking about Goldenglue’s dismal performance this year. With a 2-8 record heading into the second half of the Spring Split, the team felt the need to get creative by tapping in Piglet. He is a carry-oriented player who likes to be aggressive in lane. 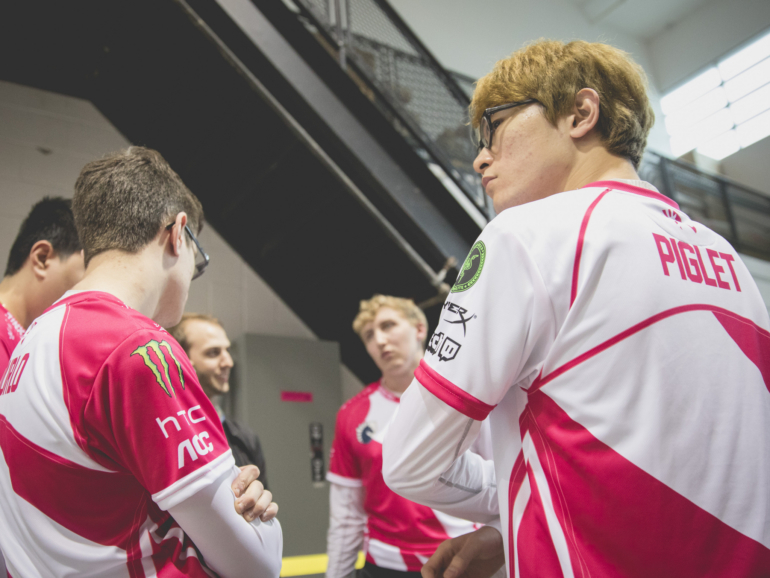 But what Piglet may bring most of all is increased synergy with the team’s other Korean import, Kim “Reignover” Yeu-jin. Reignover’s performance has fallen off the cliff this year and he has looked completely uncomfortable in the meta of aggressive, assassin-style junglers. He frequently mis-judges either his damage or his team’s ability to follow-up, resulting in silly forays into the midst of enemies ready to kill him. Perhaps teaming the two Koreans up will allow each to help the other. Synergy between mid lane and jungle is extremely important in the standard lanes meta and Liquid is betting big on that improving with this move. In recent weeks, Reignover has modified his pathing and visited Piglet more often in the bot lane, but maybe having him stay on the top and mid side of the map plays to his strengths more. And then there’s Piglet’s carry mentality, which might free Reignover to play utility junglers like Rek’Sai that he’s most comfortable on. You can see some logic in the way Liquid’s thinking about its resource allocation. But moving Piglet opens a hole in the bot lane, and with limited time to find a replacement, Liquid went back to a familiar well: former Team Liquid Academy mid laner, Jung “Youngbin” Young-bin. A mid laner at ADC? And someone who hasn’t played competitively for a year? It sounds like lunacy, right? Dig deeper, and you can kind of see what Liquid is thinking. The Piglet/Matt Elento duo lane clearly isn’t working. Matt has diligently grown as a player and shot caller, but they often don’t look to be on the same page, which has resulted un-thinkable 2v2 deaths. It’s hard to imagine Youngbin’s synergy with Matt being substantially worse. And in an era of utility-style ADCs, they may not need to actually win lane in order to survive. After all, teams like FlyQuest and Echo Fox are doing much better than Liquid with perceived liabilities in the duo lane. If you look hard enough at each individual move, you can see bits of what the team is thinking. But step back and look at what they’ve done over the last several years, and the picture isn’t very clear. For years they’ve depended on Piglet’s World Champion pedigree and mechanics. What if he isn’t that player anymore? What was it that they saw in scrims that made it hard to move on from Goldenglue, someone that they’ve had in the organization for nearly a year? How is it they can pluck Youngbin from his university studies at University of California-Irvine and immediately have better results than they were experiencing with the old team? And what confidence can the team have in its coaching, scouting, and scrims if this new iteration so clearly outperformed the team they had game-planned around for months? In a vacuum, it looks like Liquid is diligently re-shaping its team to improve at all costs. But at a higher level, each move Liquid makes muddles the picture even more.